Chemistry, a European Journal, 2015, 21,16941–16947. First published online 2 Oct 2015. The ability to self-assemble nanosized ligand-stabilized metal oxide or semiconductor materials offers an intriguing route to engineer nanomaterials with new tailored properties from the disparate components. We describe a novel one-pot two-step organometallic approach to prepare ZnO nanocrystals (NCs) coated with deprotonated 4-(dodecyloxy)benzoic acid (i.e., an X-type liquid-crystalline ligand) as a model LC system (termed ZnO-LC1 NCs). Langmuir and Langmuir–Blodgett films of the resulting hybrids are investigated. 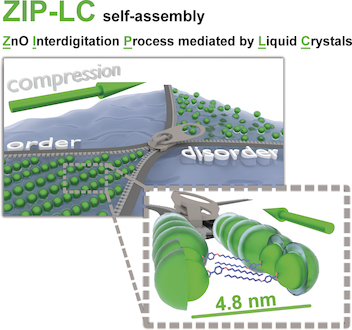 The observed behavior of the ZnO NCs at the air/water interface is rationalized by invoking a ZnO-interdigitation process mediated by the anchored liquid-crystalline shell. The ordered superstructures form according to mechanism based on a ZnO-interdigitation process mediated by liquid crystals (termed ZIP-LC). The external and directed force applied upon compression at the air/water interface and the packing of the ligands that stabilize the ZnO cores drives the formation of nanorods of ordered internal structure. To study the process in detail, we follow a nontraditional protocol of thin-film investigation. We collect the films from the air/water interface in powder form (), resuspend the powder in organic solvents and utilize otherwise unavailable experimental techniques. The structural and physical properties of the resulting superlattices were studied by using electron microscopy, atomic force microscopy, X-ray studies, dynamic light scattering, thermogravimetric analysis, UV/Vis absorption, and photoluminescence spectroscopy.